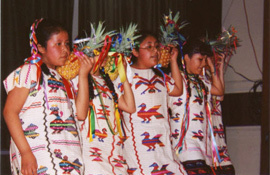 Cultural performances are often a part of Cinco de Mayo festivities. Photo from TheCasa Educational Office at Oregon State University. Cinco de Mayo literally means “the fifth of May” in Spanish. Cinco de Mayo is a national holiday in Mexico, celebrating Mexico’s victory over the French army at the Battle of Puebla in Zaragosa on May 5, 1862. In the 1850’s France wanted to gain a foothold in the western hemisphere, and tried to impose its rule on Mexico. The French army, dispatched by Emperor Napoleon III to do this, was larger and much better equipped than the Mexican army. But the Mexican army, under the command of General Ignacio Zaragosa, defeated the French army, forcing them to retreat and inflicting serious losses. The loss was only a temporary setback for the French, who returned to defeat Mexican forces in 1863. However, the memory of the victory at Zaragosa was a source of pride that sustained Mexicans under French rule, which continued until 1867. In Mexico and in many U.S. states in the West and Southwest where there is a large population of Mexican-Americans, Cinco de Mayo is celebrated with parades, Mexican food, music, and dancing. It has become a celebration of Mexican culture, and today many non-Mexican Americans participate in the festivities.